​We began our first round of STAAR Testing this week at WHS. Our freshmen and sophomores completed the STAAR Assessments in English this past week. It was a smooth week of testing which can always be a challenge when one grade level is testing and the others are business as usual. While we have only 32 days of school left, we will take another 3 STAAR assessments, have 10 days of AP testing and 4 days of final exams. The good news is that none of our students will be involved with all these days, but our daily schedules can feel a little different. 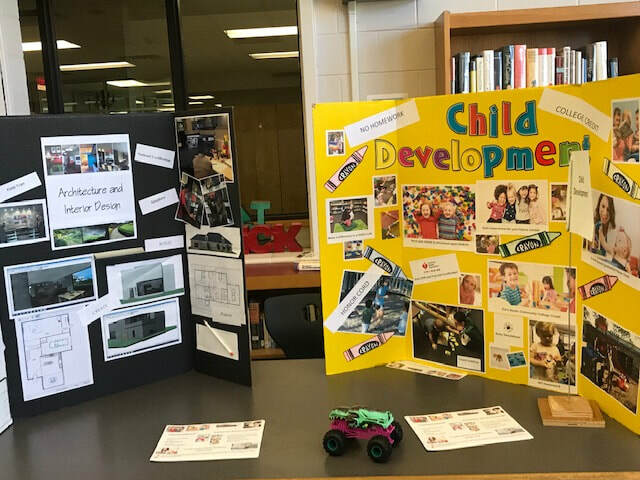 Our Educational Partners, Chris Hansen and Lisa Johnson, had the innovative idea of bringing all stakeholders together for a night of digital learning. 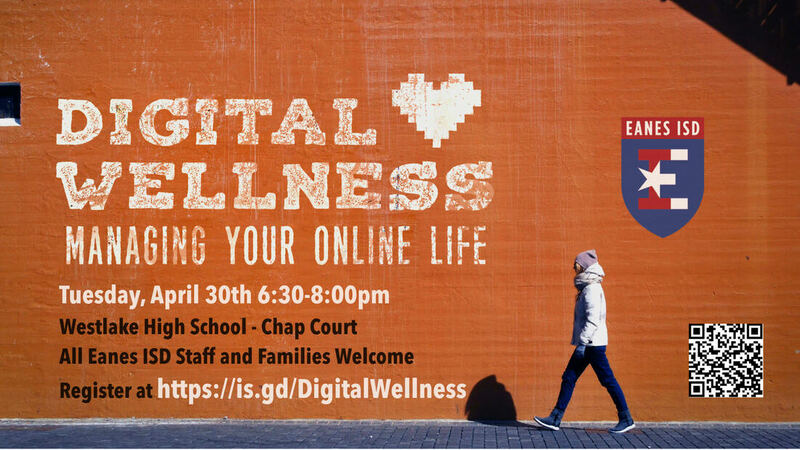 Eanes ISD is proud to present "Digital Wellness: Managing Your Online Life". The event will be held at Westlake High School. All Eanes ISD Staff, Families, and Students are welcome. Society has shifted in many ways with increased access to connected devices and online platforms. How are we as participants in this new world managing this new environment as well as leveraging the possibilities technology continues to introduce? 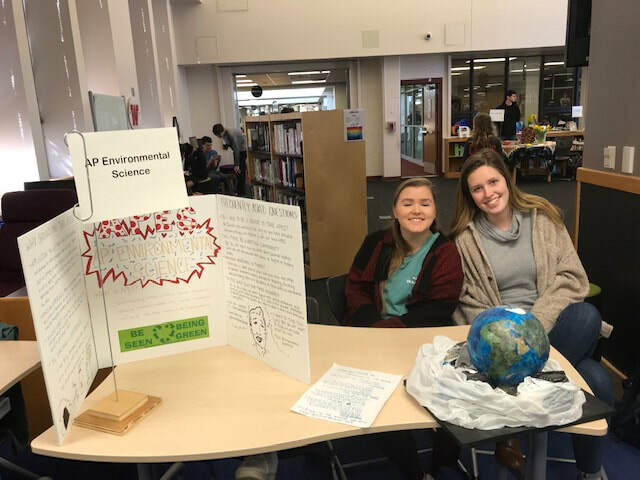 Discover resources and management techniques that Eanes ISD makes available to students and parents through thoughtful technology integration in a variety of presentation and exploration opportunities. 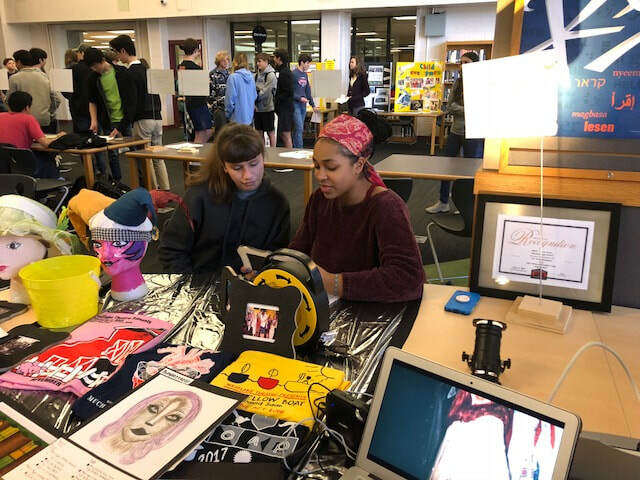 A wide range of topics will be covered ranging from data privacy and web filtration to screen time, defeating digital distractions, digital assessment tools, and apps for creativity. Westlake High School is officially 50 years old as a campus. Over the next few months and throughout the summer, you will be receiving information about celebration plans which will all take place this fall. If you would like to save the date, the weekend of October 18th will be the weekend we honor our WHS alumni, community and WHS staff that has made this the wonderful campus. 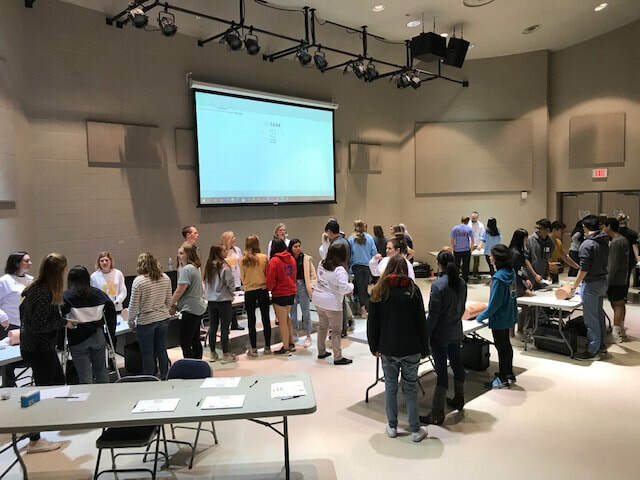 As part of the celebration and reflection of our 50 years, we created a survey with our Beyond AP Stats students to randomly sample students, parents and staff. The survey is posted on our newspaper’s website, the Featherduster at https://westlakefeatherduster.com/. Feel free to complete this survey as well if you were not randomly selected. This information will help guide our student groups and staff as we continue to grow from valuable feedback. As you spend time with our students and staff, you begin to realize the fast paced world that we all live in today. Everything is fast, quick, faster. And then everything must be decided quickly into something you like and agree with or dislike and disagree with. However, take heart - the ability to slow down to communicate can be seen in many of classrooms daily. What I see reinforced daily by some of our outstanding teachers is that slowing down and using stories can be highly effective when communicating with this age group. Stories, personal reflections, and memories are an excellent tool to talk and engage with each other. When I am in classrooms, there is power when a teacher or student takes the time to share. 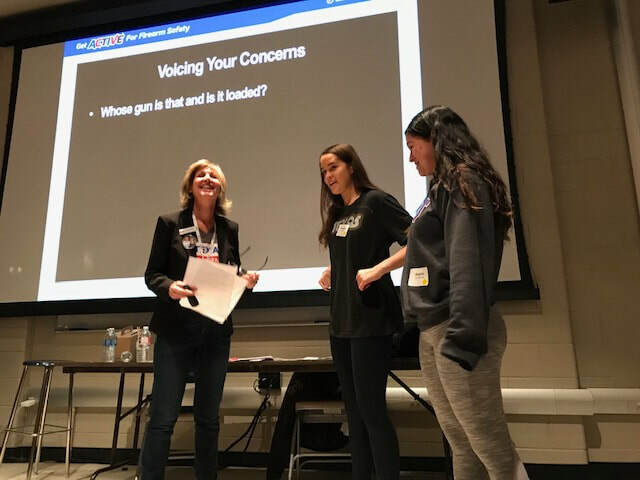 This also takes place in conversations between classes, when students visit teachers during lunch, and during extracurricular time. Stories matter - especially when they are personal stories. While one may receive the teenage eye roll or distant look, our kids are listening. Our students, compared to their peers, are excellent at personal interactions with each other and adults. This is an area that makes our campus very unique. 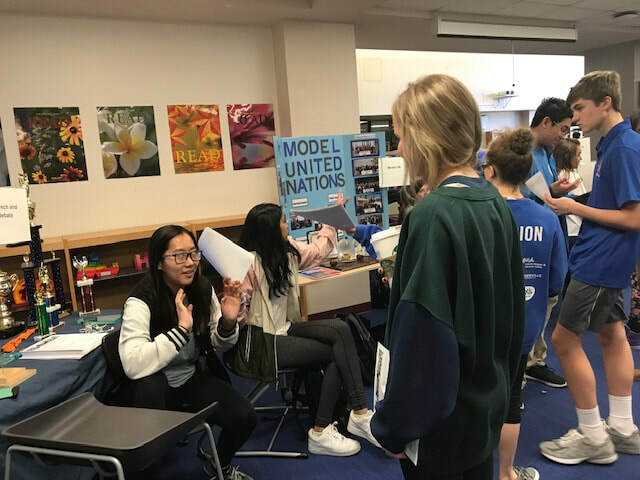 During this week, we had an international speaker visit and two different groups visit and tour WHS. One of the common compliments delivered to me as people leave after their time with us is the ability of our students to engage directly. Eye contact, body language, ability to ask questions and true listening skills are skills that this community develops at the highest levels. Do we as parents still receive one word answers, if not just the angstful teenage grunt - yes! But do rest easy that when our students are engaged with teachers, visitors and each other, they are phenomenal. Everyone returned to campus after Spring Break rested and ready to go. We are excited as we head towards the last few months. We have a multitude of major events to go, and we look forward to an exciting and memorable finish. As we get older, there are a few universal truths that get discussed regularly. 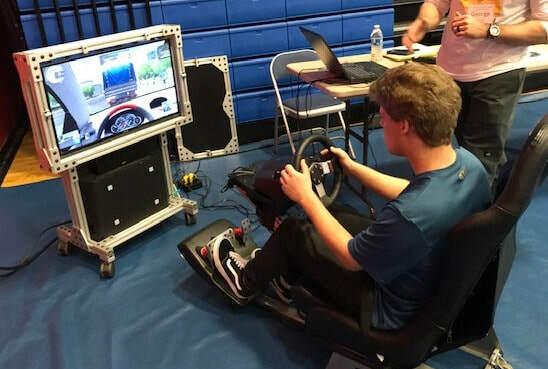 One of these is how quickly time can progress as our students move from elementary to middle school, and as they then move on and complete their time at Westlake High School. Seniors - 94% completed at WHS and 98% with their full district experience. As I am planning on attending a wedding weekend beginning this evening of two former Chaparrals, I was reminded of a conversation I had with one of their moms last fall. There is a large gap in age between her second and third child (10 years). She said the greatest change she made in raising these two kids was the amount of interaction she created with her youngest child during her senior year. She made it a daily priority to spend time with her baby girl during the last part of her Eanes experience. She and her daughter scheduled time every day to have 5-10 minutes dedicated to their relationship. That looked very different each day, but she made me promise to spend time with my girls every day - for time does move quickly. If you look at the numbers above, it may be time to schedule that daily time in now! As I am close with the kids, it does appear the youngest did actually enjoy the daily time as well. 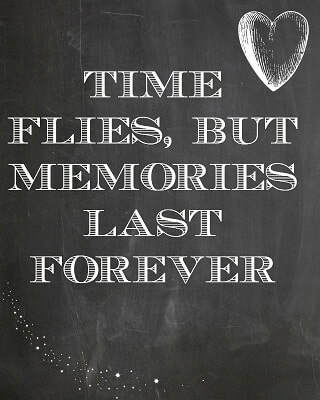 Our parents have raised some fabulous young adults so reward yourself with the gift of time with your kids. Spring break is a mere 7 days away. We are anxiously awaiting how next week will progress with the calendar adjustment of a week of a new quarter beginning before the break, coupled with Daylight Savings Time occurring during a non-Spring Break week. With a large organization such as a high school, we shall see if there is any impact. The extremely cold weather had a very calming effect on the campus earlier this week, which was quite pleasant. 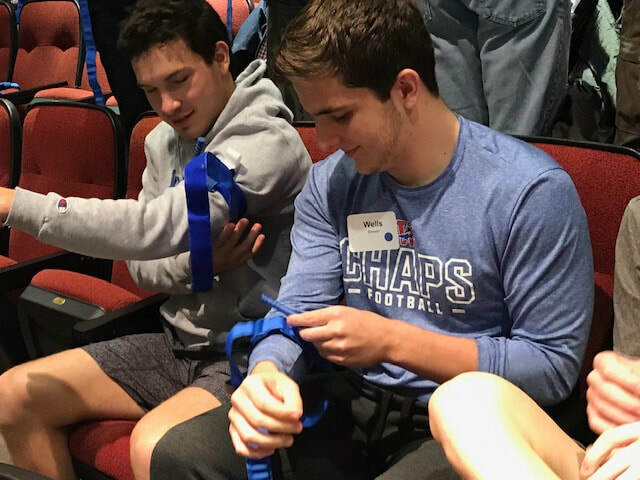 I have learned over the years that you never know how adjustments can influence a large group, but that also is what makes showing up to a high school campus intriguing daily. If one wants to see the impact of the ever changing patterns of Texas weather, a high school is a fabulous space. With three thousand folks in one building for at least 8 hours a day, the weather can instantly change people’s attitudes in a hurry. You have the kids who love the cold and get excited about the brisk air between classes. You have the kids who simply hate it when the weather goes below 60 degrees and the passing periods become a game of how to manage the walk between their classes without ever going outside. Some love the heat while others shy away from the sun at all costs. Some will walk through a drizzle to heavy rain while others have umbrellas and ponchos handy in their backpacks daily. And then if it snows, we all lose our adult minds and immediately become little kids again as seen when our students took to venturing outside on February 8th to “play in the snow” while taking videos and pics. We hope y'all enjoy the warm Saturday before turning around to cover the plants and shrubs on Sunday night. 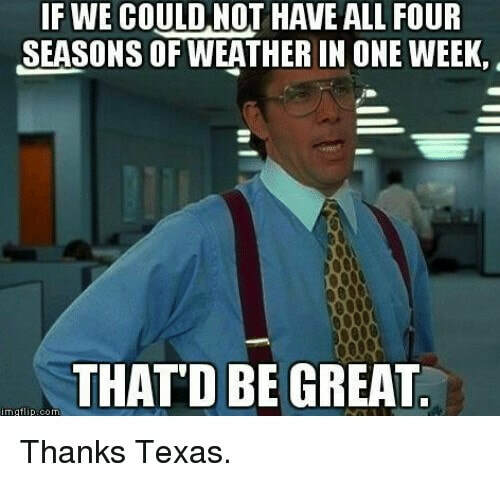 For those who love consistency, we can look forward to our Austin summer where we know we will have hot and extra hot as our forecast for a smooth 3-4 months. Next week will be the end of our third quarter at Westlake High School. The calendar is unique this year for we will end a quarter before spring break with an extra week between the quarter ending and the beginning of Spring Break 2019. We hope this will actually provide a little relief as the end of quarter usually brings an abrupt break, but the extra week may have a positive impact on our students and staff. 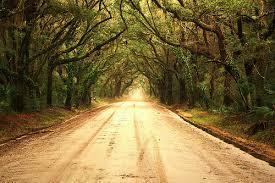 Many of us may remember the poem “The Road Not Taken” by Robert Frost. A few of us may have even memorized all or part of this poem. This poem was one of the most widely read and discussed poems in classrooms for multiple decades in our country. ​The poem has been widely interpreted as a life lesson about taking the less traveled path. Take the different path. Take an original path in your life and that may make all the difference. It spoke to a rebellious path. It resonated with teenagers of many generations for its allowance of individual freedom and choice. 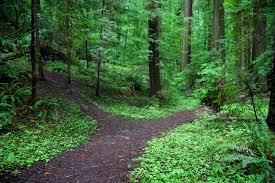 The poem has also been interpreted that no matter the path one takes you may miss out and regret taking either path. That there are always experiences missed when a choice or path is selected. What is the path I should take (student) or help my kid choose (parent)? As we have conversations with our students and parents, we ask a lot of questions about the path or paths you have taken as a parent. We talk to our students about the path and paths we selected. Stories and personal narratives on choices seem to be the best way to help make these decisions. When one tells his or her own story, there are always major choices to be discussed as a family. When talking to our children, our experiences as a family can be very different but also impactful. ​Kids also assume our paths are finished and done. This may be a good time to mention new paths you may see yourself heading down as you continue to grow. 2. Juniors, sophomores, and freshmen are all involved with course selection. 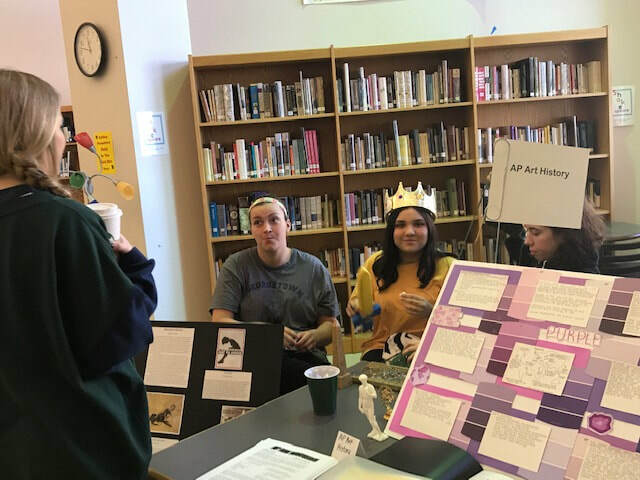 This time period can cause a general angst, elation, anger, concern, joy, sadness, and exhilaration, depending on what year you are in at WHS and what is happening in the world of decision making. 1. How can I help you make these decisions? 2. How can I assist you in finding your path at WHS? 3. How can I help you select the right college for you? Research still shows that parents have the second greatest influence on their kids outside of their friends. I recently read a study where the numbers were 51% friends, while parents were at 49% - that's a pretty close race for influence. I believe the key word is influence. As our kids grow into adults, we become more of influencers than autocratic decision makers for them. We hope you can find the time to talk to your students about all these decisions. Listen. Advise. Listen. Counsel. Listen. Recommend. Listen. Suggest. You have raised some magnificent children: trust yourself as you listen to their thoughts. what I choose is my voice. As always, we are here to support y'all during these days. We hope you have a wonderful weekend. 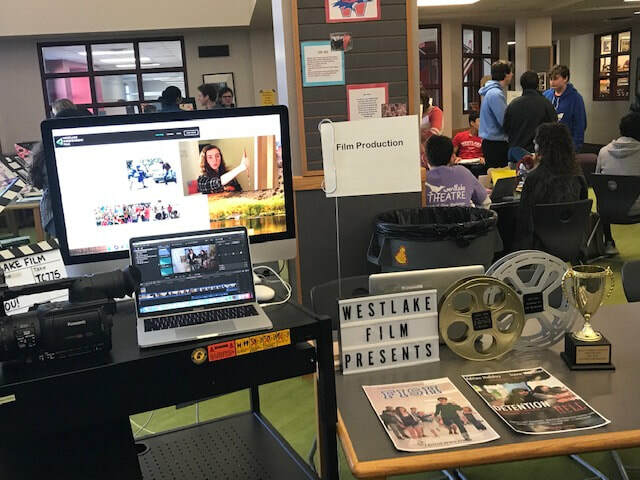 We had the opportunity to host TraumaRama on Tuesday at Westlake High School. 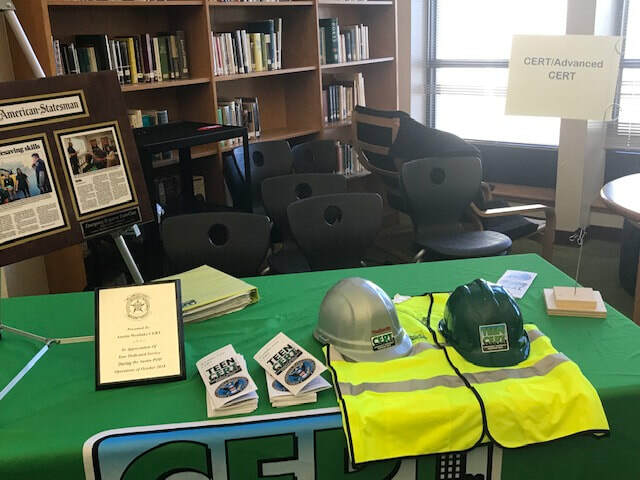 It was a day for students to learn and experience Stop the Bleed training, a Distracted Driving simulation, Q&A with a medical professional panel and more. 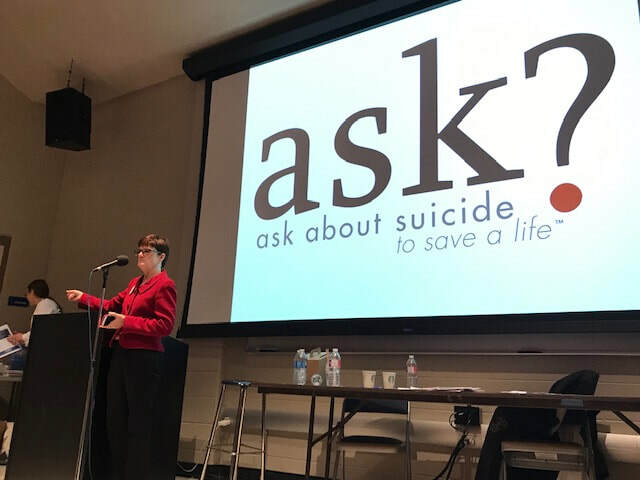 The Eastern Association of Surgeons of Trauma, or EAST, was holding its 2019 conference in Austin and chose Westlake as its outreach community. 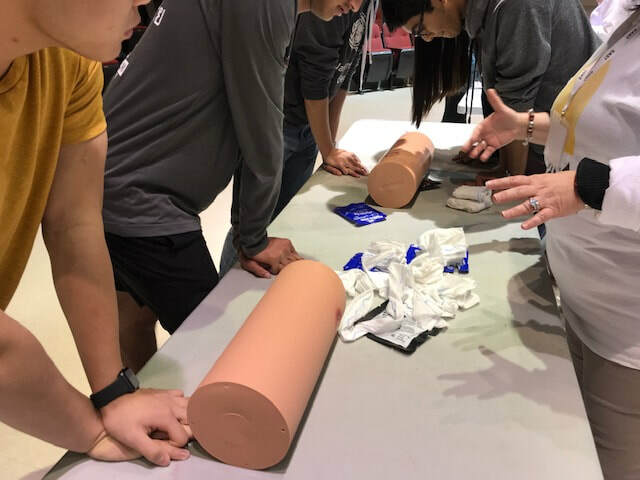 Approximately 80 trauma surgeons spent the day with our students discussing topics that are important to teenagers and safety. We like our community to get to know our staff and see the great things we are doing here at WHS. Here's another Teacher Feature for a glimpse into some pretty cool stuff. Mobile Technology: Small changes that have a big impact on instruction. Chris Peters is our new Algebra I teacher at Westlake High School. She came to us from Corpus Christi ISD. She has been teaching mathematics for over 30 years...and is still lovin’ it. 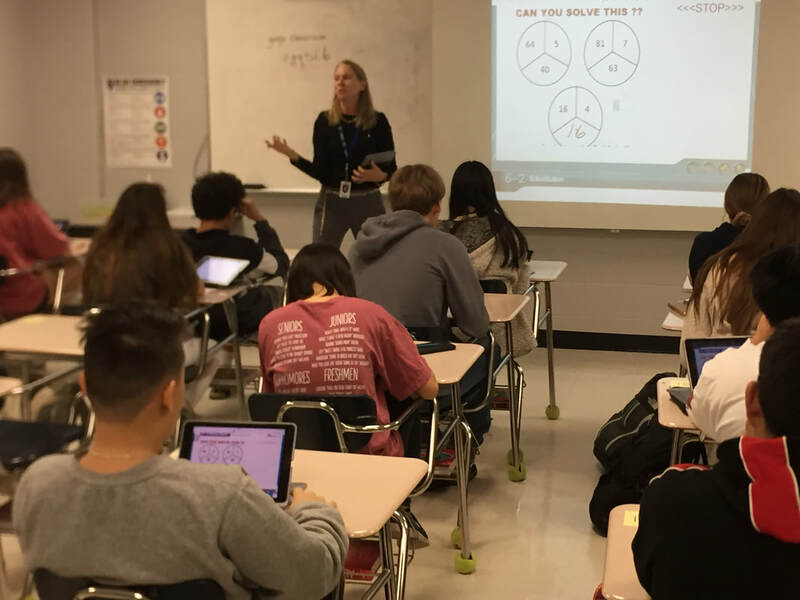 Mrs. Peters has embraced the technology available to teachers and students in Eanes ISD, and has utilized it in ways that have enhanced teaching and learning in the classroom. She has used the Notability app on the iPad and AppleTV to transform her device into a mobile presentation system. She can present information and work out math problems “on the board” anywhere in the room. This freedom allows her to walk around the room while lecturing and interact one-on-one with students. She can also hand her device to students in the class, and they can work out problems “on the board” for their peers from the comfort of their desk. 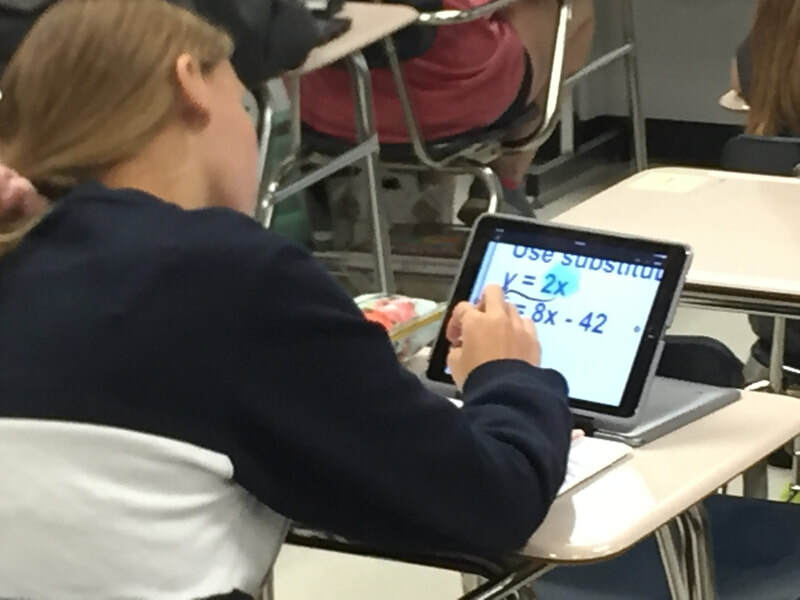 Students can use Notability and the iPad’s split screen feature to take notes while Mrs. Peters lectures, and have a calculator open on the device at the same time for solving problems and graphing functions. 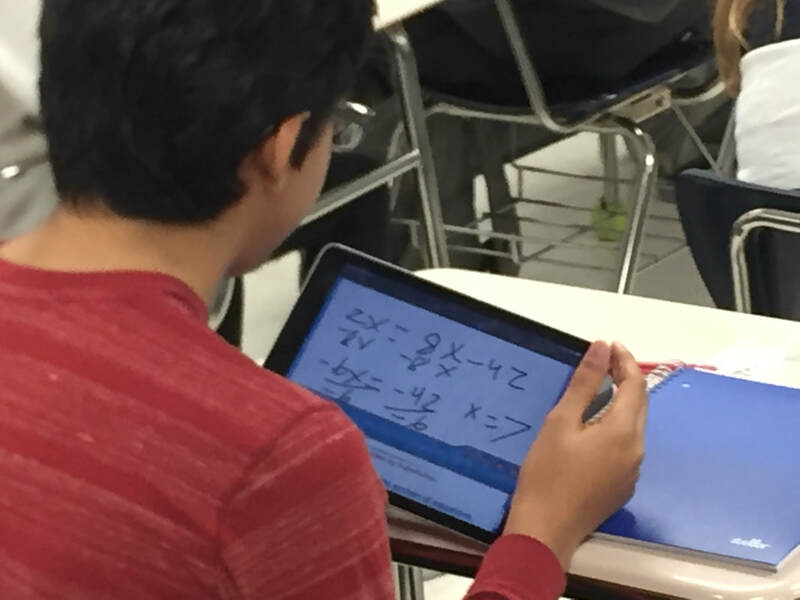 This simple yet innovative use of our district technology simplifies student workflow, and gives Mrs. Peters the flexibility to work one-on-one with students while she lectures. Additionally, her use of Google Classroom to distribute and collect classwork and materials improves workflow efficiency in the classroom. This makes it easier for students to spend more time and energy on their learning, and less time looking for that paper from yesterday’s class. It is simple yet effective strategies like these that show us how responsible use of technology can lower anxiety and improve efficiency of people not only in the school setting, but in the workplace as well. We are fortunate to have access to these tools in Eanes ISD, and the positive impacts of their presence can be felt throughout our campus. ​Mrs. Peters wishes to make all teachers’ teaching lives easier--she will be happy to have you come and visit a class--or sit together and talk strategies to make students’ and teacher’s lives better and easier. ​Have a wonderful three day weekend! Every once in a while, it is good to take on a new challenge. We want to inform you of the challenge that is happening on our campus next week and invite our parents and staff to participate as well. Cell phones are an ever-present reality. 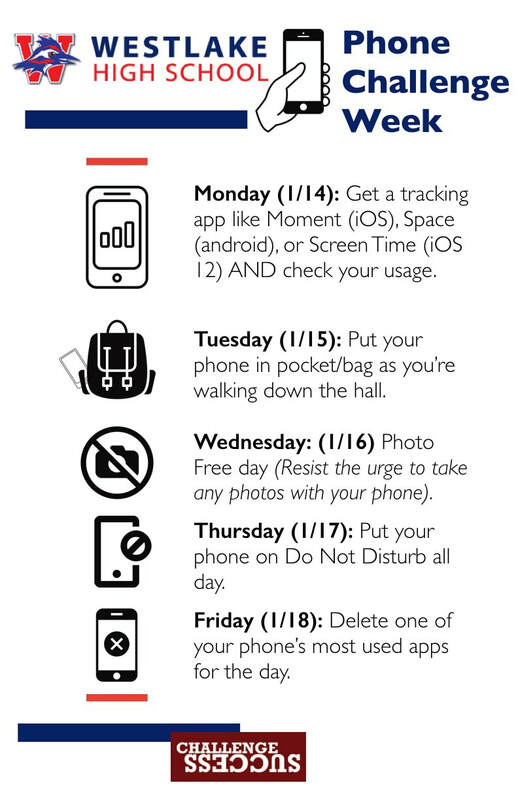 This coming week we want to focus on and provide strategies for students to self-manage their personal device usage. Each day we have one strategy to challenge them. 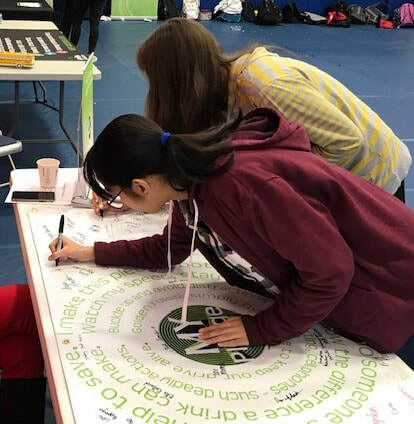 We encourage parents and guardians to try the challenges with your students that day - they are a great way to springboard conversation around supporting your teenager with setting healthy personal digital habits and managing boundaries. It should also be noted that this is not intended to be a “tech detox”, it is a way to be mindful of our device usage and personal habits and find a peaceful way to coexist with them. 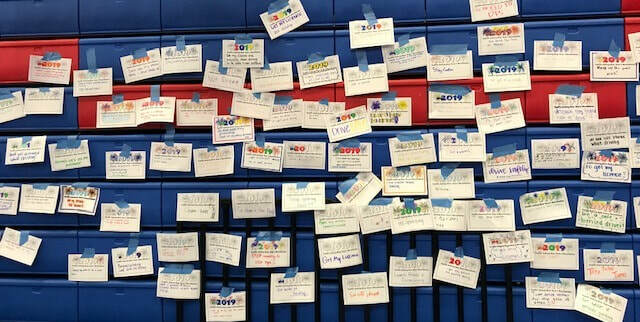 The “goal is to help kids regulate themselves, learn how to manage their emotions, and set boundaries for themselves.” You can read more about the original challenge here. ​If you are interested in knowing more about these challenges, check out the Bored and Brilliant podcast, Manoush Zomorodi’s book Bored and Brilliant: How Spacing Out Can Unlock Your Most Productive and Creative Self, and her TED Talk. We all have a conceived idea or notion of what the holidays should be like as a family. Through our collective experience, there is a certain expectation of grandeur and pageantry associated with this break. This has been shaped by movies, songs, poems and family history. As we all know, the romanticized version of the holidays may or may not happen. The good news is that we have data to help us all through the holidays as we attempt to make memories with our kids. 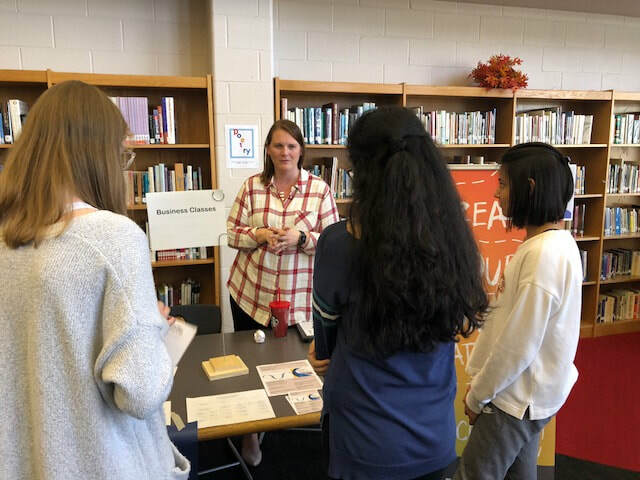 Our economics teacher, Mrs. McConnell, had a panel of college freshmen come visit her classroom on Monday for a panel discussion of life in college. Each class had 5-6 college freshmen from various schools. 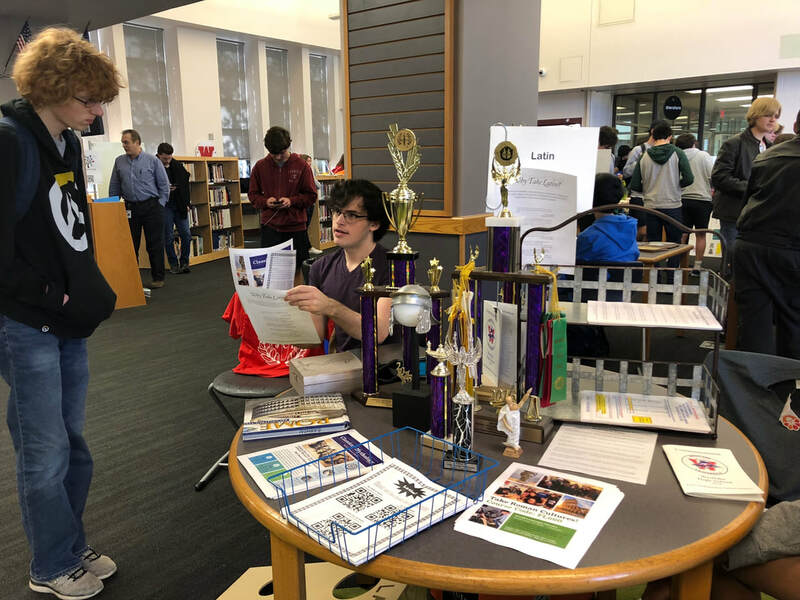 The questions ranged from transitioning to a college campus, the interactions with professors, advice for your first semester, and advice for your last semester at WHS. There also was a time for questions. Here's the good news: Your kids value the time they spend with you! In the advice portion of the questioning about the last months at WHS, parents came up in every group. Each group mentioned appreciating your parents and home cooked meals. "Appreciate your teachers and parents. Learn how to do laundry. Learn how to cook something-anything." "Appreciate home cooked meals. Enjoy the time with your family. Your parents really do alot for you-you may not realize." "Appreciate your parents and coming home to see them everyday." "Your parents and home cooked food." "Your parents and a home cooked meal, and showering without shoes on." ​As we head towards a long break, the message may be that our kids do like being with their parents and family. They may not verbalize it, but the adults in their lives do matter. Enjoy the time with your family, and as the seniors were told, you may be on a college campus in less than 6 months so appreciate the time and meals - evidently we have a lot of solid cooks/chefs in our family homes!